This behind-the-scenes look at Franklin D. Roosevelt’s extraordinary skill as a blue-water sailor explores how his love of the sea shaped his approach to public service and even influenced the course of events in World War II. Family and friends, Secret Service agents, and others reveal never-before-told stories of their days afloat with America’s greatest seafaring president, including how he escaped injury when fire broke out aboard his small schooner, how ships were modified to accommodate his disability, and details of his wartime rendezvous with Winston Churchill. Sailing pals discuss his abilities as a skipper along with his enjoyment of an evening cocktail at sea during the days of Prohibition. Letters and other documents illustrate how the sea was never far from Roosevelt’s thoughts. 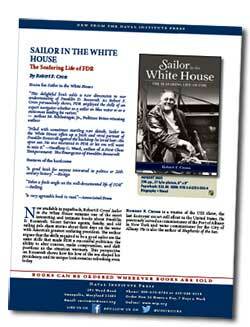 Click here for a pdf of the Official Press Release from the Naval Institute Press. Robert Cross examines Roosevelt’s great affection for the sea in the context of an era dominated by the Great Depression and two world wars. 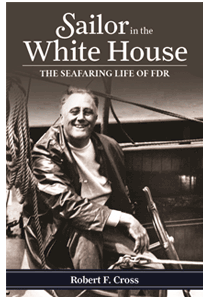 While some criticized Roosevelt for taking too many seagoing trips—he logged hundreds of thousands of miles at sea and was sometimes out of touch with the White House and the Secret Service for hours—FDR was quick to explain that his lengthy voyages allowed him to personally assess the world situation instead of relying solely on White House briefing books. 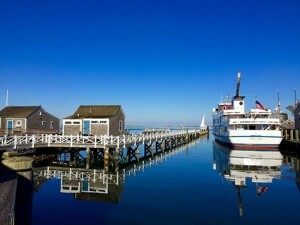 The author argues that the skills required to be a good sailor have much in common with those needed to be a successful politician: the ability to alter courses, make compromises, and shift positions as the situation warrants. Cross describes FDR as a master at dealing with the unexpected, allowing him to excel in the Navy department, the governor’s mansion, and the White House, as well as on the open sea. From luxury ocean liners and presidential yachts to submarines and kayaks, this book lists all of the vessels on which FDR sailed and includes some never-before-published photographs.